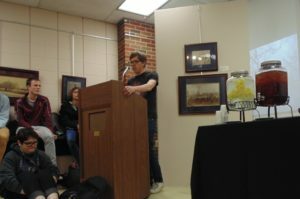 Four English professors and one student read their literary work for a small audience of students and staff at 12 p.m. on Wednesday, April 4 in the Schumacher Gallery (the iconic David Summers was in the audience — that’s how you know it’s good). 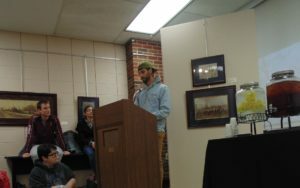 Senior Nick Bonsignore participated in the summer scholars program with English professor Kevin Griffith and read poems of his with influence from contemporary rap artists and noted poets, including a couple with components from both Philip Larkin and Earl Sweatshirt. 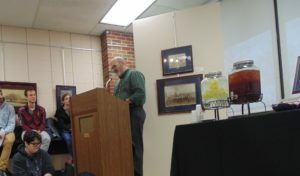 The four English professors that read consisted of Griffith, Bryan Hurt, Paige Webb, and Greg Belliveau. Griffith read a series of poems that he wrote about a post-apocalyptic Ohio, featuring a conflicted God that’s frustrated by the voting habits of the humans, one of the poems even titled “Letter from God.” Griffith wrote with strong intertextuality, or references to other works in his own. Bryan Hurt read his essay titled “The Ladies of Bexley,” in which he narrated his struggle with back and orthodontic problems that later led to yet another struggle: pilates. Hurt used a lot of humor and figurative language to sustain a lighter tone to the narrative while keeping it personal, as well, and making the audience able to resonate with him. Greg Belliveau read “Shirtless Ray Zombrosky,” an essay from his recent book Seeds. It was a sad narrative, sort of a vignette, a remembrance of the impact that a friend had left on his life. Belliveau wrote of personal experiences with vivid details that connected him to his reader.